The People's Republic of Bangladesh is a country in South Asia, bordered by India on all sides except for a small border with Burma (Myanmar) to the far southeast and by the Bay of Bengal to the south. When India was partitioned in 1947, the area now known as Bangladesh became the eastern section of the country of Pakistan. Independence from Pakistan was declared in 1971. In 2007 the population was estimated at 150,448,340, making it the 7th largest country in the world in terms of population. Pax workers served in East Pakistan in the 1960s with the East Pakistan Council of Churches. In 1970 Mennonite Central Committee (MCC) provided emergency material aid following the tidal bore which killed more than 300,000 people in Noakhali district. Immediately following the bloody emergence of the new nation, Bangladesh, late in 1971, MCC workers returned to Noakhali district to provide emergency assistance there and to assist many other institutions and Bihari communities throughout the country. In 1973 and 1974, after the emergency phase, MCC began a major food production effort under the leadership of Art DeFehr, using the theme "nutritional self-sufficiency." This resulted in MCC receiving, in 1975, one of the first three gold "Bangabandhu" medals awarded by the country. Family planning, maternal child health care, and job creation programs soon became important foci. In 1987 there were 35 MCC volunteers plus approximately 175 Bangladeshi staff members, making it one of MCC 's largest programs in any country. Mennonite Brethren Board of Missions and Services personnel worked with the MCC program for a number of years. Mennonite Brethren General Conference Yearbook (1981): 104. Mennonite Yearbook and Directory (1986-87): 153. Meyers, Paul. "Bangladesh." Global Anabaptist Mennonite Encyclopedia Online. 1987. Web. 25 Apr 2019. http://gameo.org/index.php?title=Bangladesh&oldid=122064. Meyers, Paul. (1987). Bangladesh. Global Anabaptist Mennonite Encyclopedia Online. 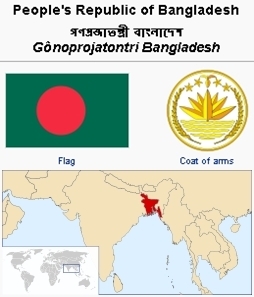 Retrieved 25 April 2019, from http://gameo.org/index.php?title=Bangladesh&oldid=122064. Adapted by permission of Herald Press, Harrisonburg, Virginia, from Mennonite Encyclopedia, Vol. 5, p. 51. All rights reserved. This page was last modified on 12 May 2014, at 07:11.